What is the Altered States Database (ASDB)? The ASDB is intended for scientists who work in the field of consciousness research. This website provides easy access to a database that contains data extracted from the scientific literature about altered states of consciousness (ASCs) assessed with questionnaires. All available data from quality controlled scientific journals has been extracted and is now freely and comprehensibly available for research. The database shall allow scientists to compare the ASC effects elucidated by different drugs and non-pharmacological methods of induction. Such a comparison will help our understanding of human consciousness functions – a question interesting for basic clinical research, and everyone who is interested in the nature of being human. The ASDB is set up in the spirit of OpenScience by making data freely available for everyone. If you are using the ASDB as a non-scientist, please beware of any overinterpretation and note that the database does not provide suitable information to infer dosaging or sufficient information on the harmfulness potential of individual methods. Most data origins from controlled laboratory experiments, where the setting of ASC induction (e.g. drug consumption), as well as substance preparations can differ substantially from recreational usage of the same substance. The mere existence of scientific data on the effects of diverse drugs, does not imply that consumption would be safe. The ASDB project is led by Timo Torsten Schmidt. Part of the work has been conducted within practical training during university teaching between 2015-2017 at the University of Osnabrück. Dr. Axel Kohler and Dr. Uwe Friese contributed to the supervision of the project work. Henrik Berkemeyer and Renato Garita Figueiredo contributed to the implementation of the database. Hristofor Lukanov contributed the data visualization. Eelke de Vries, Aliona Cerednicnco, Artur Czeszumski, Philipp Kuhnke, Katharina Dworatzyk, Anastasia Mukhina, Aalina Nosheen, Florian Ziegler and Olha Vakhovska contributed to the literaure research, data extraction and the project in general. Multiple more Master students of Cognitive Science, University of Osnabrück contributed to the project. The ASDB project was carried out without financial funding. Work on the ASDB was conducted by a team of students under the supervision of Timo Torsten Schmidt, where contributions were made voluntarily as part of their scientific work and academic education. Timo Torsten Schmidt was supported by a fellowship of the Fellow Programm Freise Wissen by the Wikimedia Foundation, Stifterverband, and VolkswagenStiftung to work on the ASDB (See project website). There are no financial conflicts of interest. 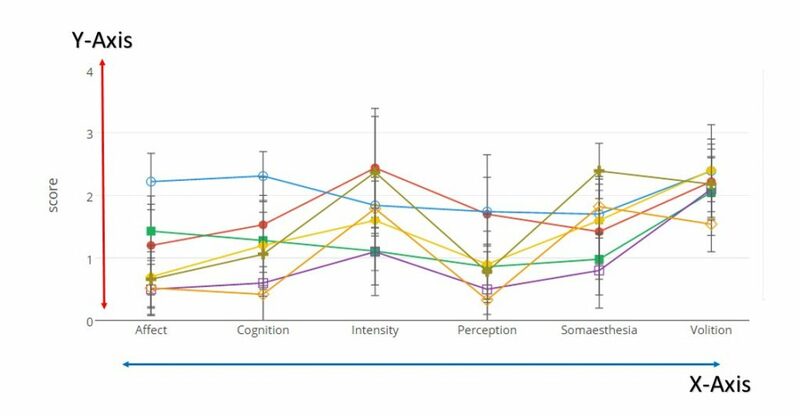 A systematic literature research was performed into psychometric tools which assess the subjective experience during ASCs. Based on overviews by Passie (2007), Yeginer (2000), and MacKillop & de Wit (2013) an extensive list was compiled. To identify relevant questionnaires, first the conceptual framework was evaluated to (i) cover a broad spectrum of phenomena and to (ii) aim at comparing different induction methods. Trait questionnaires were excluded as not being relevant for the database. Oceanic Boundlesness (OBN): Items clustered in the OBN dimension measure the positive symptoms of dissolution of boundaries between self and surroundings. In general, they describe common states that can be compared to a mystical experience.(e.g. I had the feeling everything around me was somehow unreal; The boundary between myself and my surroundings seemed to blur; I felt totally free and released from all responsibilities.) GERMAN: Ozeanische Selbstentgrenzung (OSE). Dittrich, A. Ätiologie-unabhängige Strukturen veränderter Wachbewusstseinszustände. (Enke, 1985). Dittrich, A. Zusammenstellung eines Fragebogens (APZ) zur Erfassung abnormer psychischer Zustände [Construction of a questionnaire (APZ) for assessing abnormal mental states]. Z Klin Psychol Psychiatr Psychother 23, 12–20 (1975). Oceanic Boundlesness (OBN): Items (e.g. I had the feeling everything around me was somehow unreal; The boundary between myself and my surroundings seemed to blur; I felt totally free and released from all responsibilities. ) clustered in the OBN dimension measure the positive symptoms of dissolution of boundaries between self and surroundings. In general, they describe common states that can be compared to a mystical experience. GERMAN: Ozeanische Selbstentgrenzung (OSE). Bodmer, I., Dittrich, A. & Lamparter, D. in Welten des Bewusstseins. Bd. 3 (eds. Hofmann, A. & Leuner, H.) 45–58 (Experimentelle Psychologie, Neurobiologie und Chemie., 1994). Dittrich, A., Lamparter, D. & Maurer, M. 5D-ABZ: Fragebogen zur Erfassung Aussergewöhnlicher Bewusstseinszustände. Eine kurze Einführung [5D-ASC: Questionnaire for the assessment of altered states of consciousness. A short introduction]. (2006). Studerus, E., Gamma, A. & Vollenweider, F. X. Psychometric evaluation of the altered states of consciousness rating scale (OAV). PloS one 5, (2010). Affect: It includes items describing emotional as well as affective responses (e.g. Feel like laughing; Feel presence of numinous force, higher power, God; Awe, amazement ). Perception: It includes items describing changes in the process of perceiving. Specifically, they describe alterations in the ordinary visual, auditory, gustatory, and olfactory experiences (e.g. Change in visual distinctness of objects in room; Visual synesthesia (“seeing” sound or other non-visual perception); Kaleidoscopic nature of images/visions/hallucinations ) . Cognition: It includes items describing alterations in thought processes or content (e.g. Sense of chaos; Memories of childhood; Change in rate of thinking) . Volition: it includes items describing changes in the interactive capacity such as the faculty of making deliberate choices or decisions. Specifically, alterations in the ability to willfully interact can be addressed to themselves, the environment, or certain aspects of the experience (e.g. Able to focus attention; Able to remind yourself of being in a research room, being administered a drug, the temporary nature of the experience; Able to follow the sequence of effects). Intensity: It includes items describing the overall strength and the course of the experience (e.g. Waxing and waning of the experience; Intensity; High). Strassman, R. J., Qualls, C. R., Uhlenhuth, E. H. & Kellner, R. Dose-response study of N,N-dimethyltryptamine in humans. II. Subjective effects and preliminary results of a new rating scale. Arch. Gen. Psychiatry 51, 98–108 (1994). Pahnke, W. N. Drugs and Mysticism. International Journal of Parapsychology 8, 295–314 (1966). Pahnke, W. N. Drugs and mysticism: An analysis of the relationship between psychedelic drugs and the mystical consciousness . (Harvard University Press, 1963). MacLean, K. A., Leoutsakos, J.-M. S., Johnson, M. W. & Griffiths, R. R. Factor Analysis of the Mystical Experience Questionnaire: A Study of Experiences Occasioned by the Hallucinogen Psilocybin. J. Sci. Study Relig. 51, 721–737 (2012). Altered experience: Items clustered in this dimension generally describes alterations in the process of undergoing of things. Specifically, its sub-dimension relates to variation in the ability of experiencing the own body, the sense of time, the intuition about external circumstances and their related meanings. Positive affect: This dimension includes items describing general positive states, in terms of feelings and emotions. Specifically, its sub-dimensions characterize experiences of joy, sexual excitement and love. Negative affect: This dimension includes items describing general negative states, in terms of feelings and emotions. Specifically, its sub-dimensions characterize experiences of anger, sadness and fear. Imagery: This dimension groupes items describing experiences of creating more or less complex mental images of things or events. Specifically, its sub-dimensions relate to the amount and vividness, in terms of quality and quantity, of such experiences. Attention: This dimension includes items characterizing changes and variation in the ability of being attentive and focused towards external events. Its sub-dimensions specify the direction and the intensity of such alterations. Pekala, R. Quantifying Consciousness: An Empirical Approach. (Plenum Press, 1991). Who might use the ASDB? The ASDB can be used by everybody. It has been designed for researchers who work on the effects of different induction methods for altered states of consciousness. We are working on suitable information for non-scientists on how to understand the presented data. However, we will limit ourselfes to explain the scientific methodology and will not provide interpretations or implications drawn from the data. Our purpose is to present neutral, unbiased scientific data. How can I know that the data is reliable? All data in the ASDB have been collected without any conflicts of interest and without any normative bias. Only data that were published in scientific journals are accepted. All articles must have undergone peer-review. Why only data published in peer-reviewed journals is present in your database? We included only data presented in peer-reviewed journals because these type of journals assure the quality of presented results. How is the data selected that is included in the ASDB? The ASDB project did not do any selection on the data. All available data have been put into the database. Only data that have been appropriately reported in a corresponding article are contained. I would like to contribute – how can I do this? In addition to the database there exists a Wikiproject to provide unbiased scientific information to the public. If you are a student and would like to participate in ongoing research, you can contact Timo Torsten Schmidt for ongoing research projects. Can users add new data to the ASDB? No, to assure quality control. Please use the contact formular to inform us about new data and we will check and upload it. The database will be updated on a regular basis (approximately every 6 month) with the most current publications. You present data from 5 questionnaires. Why did you chose this particular questionnaires? Are you planning to add more questionnaires to the database? Please see section “Background information on the questionnaire data”. We will add data from further questionnaires as soon as these have become popular enough to contribute to study overarching comparisons. How do you define altered state of consciousness? How did you chose methods of induction of altered state of consciousness for your database? Methods of induction of altered states of consciousness that are present in our database were identified through thorough literature research on prevalence of studies concerning altered state of consciousness. Feel welcome to inform us about additional methods that were not addressed by reasech yet. We keep a list and collect corresponding information for future research. Please use the contact formular. Where can I find scientific data on potential risks and harmfulness of a certain method? Nutt, D. J., King, L. A. & Phillips, L. D. Drug harms in the UK: a multicriteria decision analysis. Lancet 376, 1558–1565 (2010). There is a vast amount of illicit substances present in your database as induction methods. What is your opinion about usage of these substances? Our database is intended to provide only scientific information on the subjective experiences that these substances elicti. We do not make any political statements. We strongly advise to gather information from other sources on the legal status and potential risks that go along with the application of all methods. Why don’t you include descriptions of individual experiences in your database? Private experiences cannot be a part of our database because they are subjective and are not quantifiable and comparable with experiences of others. Questionnaires were developed to quantify experiences and are considered as a scientific method. My own altered state experience is different than your database suggest? Why? Can I get access to the data to conduct meta-analyses? I used your database in my research. How to cite it? Please cite: RG Figueiredo, H Berkemeyer, K Dworatzyk, TT Schmidt (2016) Building a unifying database to enable flexible meta-analyses of data on altered states of consciousness. Poster at ICPR 2016, Amsterdam. A datareport article will be available soon – please check for updates! 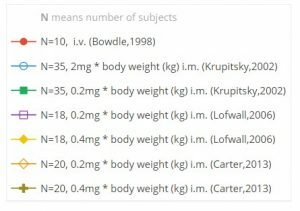 Where can I find papers that data was extracted from? We cannot provide original papers due to copyright issues. Please obtain them from the publisher. How is the ASDB implemented? How do I learn more on the empirical study of ASC experiences? Find the results of scientific reports, which investigated the effects of different induction methods of altered states of consciousness. These include the intake of substances, but also methods without substances like meditation. What does it mean to measure the effect of an induction method of an altered state of consciousness? Imagine a questionnaire was filled in three hours before a drug was administered. After the drug intake, the questionnaire is filled out again. The difference of the answers between the first and second time point would indicate an effect of the drug. In scientific studies much emphasize is put on standardized conditions under which the data is collected. To test the psychological effects of a particular substance therefore follows very well controlled procedures. Typically drugs are applied in a laboratory environment, which significantly differs from the environment in which drugs are usually consumed. If everything is kept constant and there is a controlled induction of the altered state, why are there multiple studies with the same substance, possibly with the same dosage? The answer is simple: Not everything can be kept constant. Every person reacts a little different on each substance, which can be named individual difference. This applies to single persons within one group, but also to different groups. As for example, study participants who make a well-briefed decision to take part in a laboratory setting as compared to people who consume the same drug recreationally at a music festival. Please consider when you interpret the data: The data was typically gathered in a laboratory setting. This setting by itself can alter the effects of the induction method. Hence, it is not possible to transfer these results one-to-one to different situations. Only results from peer-reviewed articles published in scientific journals are displayed. References to the original publications are provided below the graphs. We highly recommend to access the original articles and read them, as our database only covers some aspects of the data. Scientific journals have a control mechanism to guarantee high quality of the published articles. This includes that the scientific work corresponds to the common practice in the respective research fields. In peer-review, experts of the field read the article before it is published and if appropriate suggest improvements in the reported experiment and analysis. Each graph corresponds to data of studies, which were published in such journals. The exact title, authors, the year of publication and the name of the journal are given as a reference. These references give detailed information about the studies. Each graph represents data of studies, which used the same questionnaire and same induction method. The scale of the graph is a result of the applied questionnaire. Different data points represent average answers on the respective scales. Error-bars represent the variation in averaged answers. For each study, it is shown how many people were participating in the respective study. To have a profound understanding of the data presented in the ASDB, it is important to have a grasp on the nature of questionnaire studies. The selected questionnaires aim to test different aspects of an altered state experience. Multiple questions are asked, which in combination measure a particular factor (also called “basic dimension of consciousness”), which is basically an umbrella term such as “Visual restructuralization”. In other words, multiple questions aiming at the same factor are pooled together. On the bottom of each graph, the respective factors are listed. In every study, the same questionnaire is given to each study participant. The number of study participants is declared with a capital “N” (for “N”umber of subjects). Each datapoint represents the average of N participatns in one study. Please note: The more participants have been part of a study, the more reliable the data is. In the graphs you can also find a measure for the variation or variability that is found among the participatns. Each datapoint is supplemented with so called error-bars. These error-bars represent the so called standard deviation from the mean. The length of the error-bars indicates how much of differences the individual participants displayed in answering the questionnaire. Small error-bars mean that all participants had very similar experiences. Large error-bars indicate that the different participants had drastically different experiences. Switching from Line Plot to Bar Plot: What’s the Difference? With a simple click of the button in the form of a display changes the appearance of the chart. The database allows you to switch from a line plot to a bar plot and vice versa. The data provided in both cases is identical. In the bar plot, the height of the bars indicate the score. In the line plot, the height of the corresponding point indicates the score. 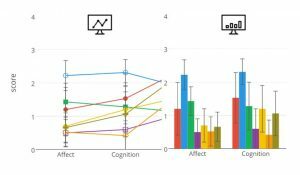 One could assume that the connection between “Affect” and “Cognition”, which are the two concepts on the x-axis, bears additional meaning of the line plot as compared to the bar plot, but this connection exists only visually and does not contain any further information. The colour coding for both types of plots is the same. It is advisable to use the type of plot which offers the clearest overview of the data. In the graphs provided by the ASDB, the information is coded within two Axes. The horizontal x-axis corresponds to the factors (the umbrella terms or sometimes called “basic dimensions of consciousness”) measured by the applied questionnaire. The x-axis in graphs provided by this database represents a so-called nominal scale. This means that the order of the concepts on the axis is irrelevant for the interpretation of the data. The vertical y-axis gives information of the score given by participants in the questionnaire. A higher score corresponds to respective answers in the questionnaire. The y-axis can also take negative values, depending on the used questionnaire. The results of different studies with the same induction method and questionnaire are represented within one graph. Each row in the legend represents the data from one study. They are color coded according to the symbol on the left of each row. Next to this symbol, “N” is given. “N” is the number of subjects who participated in the study. Furthermore, the dosage of the substance used in the study is specified. In brackets, the author and the year of publication of the respective study are shown. Using this legend, you have multiple options to manipulate the graph. It is possible to select the data which should be represented in the plot. By clicking once, you can exclude a study from the plot. By clicking twice, you can exclude all other studies but the clicked one from the plot. By hovering over with the mouse, you can expand single data points. In this case, the information of “affect” is given for each colour coded study. The first number is the exact score of the data, which is the mean of the answers given by the participants in each study respectively. “Std” is the standard deviation and gives an indication on how variable the data for the respective concept of the questionnaire was in each study.